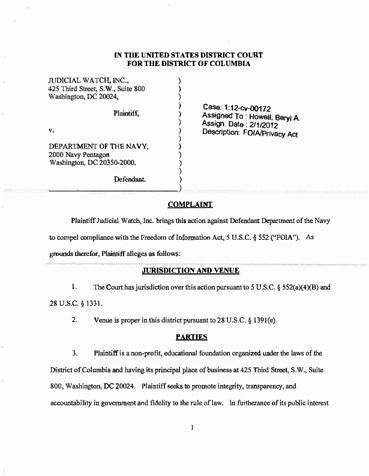 Plaintiff Judicial Watch, Inc. brings this action against Defendant Department the Navy compel compliance with the Freedom Information Act, U.S.C. 552 ("FOIN'). JURISDICTION AND VENUE The Court has jurisdiction over this action pursuant U.S.C. 552(a)(4)(B) and .s.c. 1331. Venue proper this district pursuant U.S.C. 1391(e). production. Nor has indicated whether when any responsive records will produced. processed, Defendant has failed respond the request any manner. 12. Because Defendant failed comply with the time limit set forth U.S.C. respect its fOTA request, pursuant U.S.C. 552(a)(6)(C). Defendant lllllawfully withholding records requested Plaintiff pursuant U.S.C. 552.
attorneys' fees and other litigation costs reasonably incuned this action pursuant U.S.C. 552(a)( 4)(E); and (5) grant Plaintiff such other relief the Court deems just and proper.